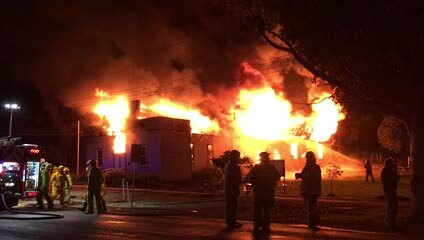 The historic Tallarook Mechanics Institute is being rebuilt after it was destroyed by fire on Saturday 5 May 2018. Established in 1891, the council-owned building was operated by a voluntary Committee of Management. Over the years it has been used for dances, fundraisers, meetings and a host of community events. More recently, the building was home to the Tallarook Farmers’ Market and a range of classes and community activities. During demolition, a number of parts were able to be salvaged for samples to assist with the rebuild including samples of pressed metal, the windows and the colour scheme. The iconic garden sculptures have also been retained. Council is working with the volunteer Committee of Management and the wider Tallarook community to develop plans to rebuild. One of the key rebuilding steps is the need to prepare some basic concept sketches before we can progress to the next stage of having architect plans developed. These architectural plans will be used as the basis to form more detailed documentation when we seek quotes for rebuilding. This sketch/concept plan will also assist us in discussions with the insurers about whether we want them to manage the rebuild or whether a cash payout is preferred, with Council then managing the rebuilding process. Your input now will help create concept sketches which we can seek further community input on before finalising plans and deciding on whether to get the insurers to rebuild. Please leave your details here to take part in the rebuilding committee. If you'd like to receive email updates on this project, please sign up below.